In Assembly elections, Akula Hanmandloo could get only 189 votes and so could not even retain his deposit. Hyderabad: The ‘Slipper Man’ is back, and how! In 2018 Assembly elections in Telangana, an Independent candidate, Akula Hanmandloo, had caught the voters’ attention with his unique campaign for Korutla Assembly seat and now he is back for Lok Sabha elections. 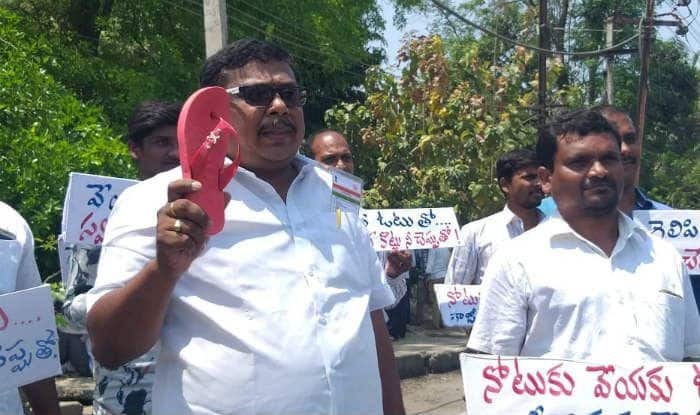 Hanmandloo campaigned with a slipper in one hand and a resignation letter in the other, urging the voters to hit him with slippers should he fail to deliver as per his poll promises and send the resignation letter to the Assembly Speaker on his behalf if they were not satisfied with his work. However, Akula Hanmandloo could get only 189 votes and hence could not even retain his deposit. But that didn’t deter him enough to stay off elections and he has entered the fray again. Hanmandloo has filed his nomination, again as an Independent candidate, from Nizamabad Lok Sabha constituency where Telangana Chief Minister K.Chandrashekar Rao’s daughter K Kavitha is a top contender. “I am not disappointed that I could get only 189 votes in the recent Assembly elections. In fact, I am convinced and determined that I should send my message against large-scale money usage by contestants. We all know huge sums of money will be spent in various forms to entice voters. I am going to urge people not to fall for money or freebies by candidates. Also, every candidate should be accountable to voters,” says Hanmandloo. In the Assembly elections last year, Hanmandloo got ‘whistle’ symbol but now he expects his choice of “slipper” ( footwear ) symbol, if available, to be allotted to him by the Election Commission after his nomination is accepted. “I have also applied for my own party registration,” informs Hanmandloo who plans to take his “slipper and resignation letter” campaign in the entire Nizamabad Lok Sabha constituency.